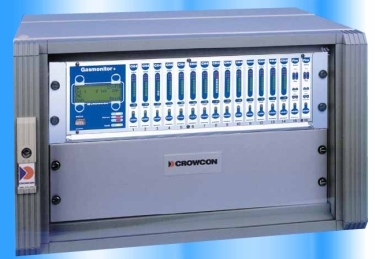 The Crowcon Gasmonitor Plus is a flexible microprocessor controlled gas detection system that has been designed with a modular approach, which enables the user to get exactly the system they require. This instrument can be found in use throughout the world, both for on and offshore applications, providing the most cost effecting solution for gas detection requirements. The Crowcon Gasmonitor Plus provides simple operation, yet doesn't compromise on flexability. All of the main day-to-day functions can be found on the front panel using push buttons. Optional relay modules can interface to the panel to provide up to a total of 84 output relays per rack. Sixteen of these relays can be configured/ voted from a combination of the three levels of alarm per channel. Gasmonitor Plus has industry standard analogue outputs, and the mechanical design is based on 19" Eurorack. This means that the Gasmonitor Plus will integrate fully with existing rack mounted protection systems on site. Gasmonitor Plus has been designed with easy servicing and maintenance in mind. Each channel is inhibited separately so that plant safety is not compromised during maintenance checks. GMON	Rack only with power card, display module, input output module, operating manual, software and PC serial interface lead. M02186	RFI screening plate - used when rack is not supplied in an enclosure. 2 plates required. M010006	Motherboard RFI screening cover, use in combination with above. S011793	Inhibit module. Provides a 24Vdc output per channel to indicate when inputs are in an inhibit state. Lead time 4 weeks. E01059	1A wire-ended fuse for input module (protects detector 24V supply). C01192	Display module fixing kit. Replaces original plastic clips for securing the display PCB.